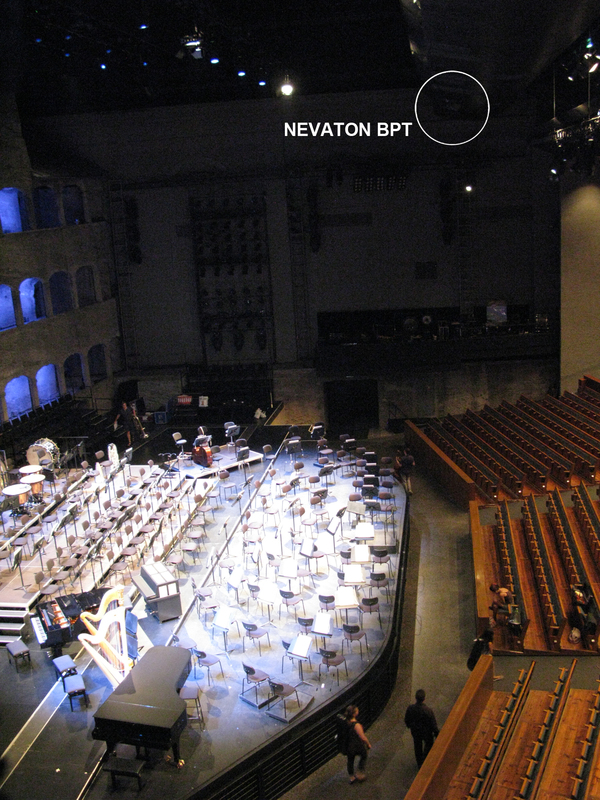 One of the tasks of sound-engineers at the Salzburg Festival is to make live-recordings of the performances. 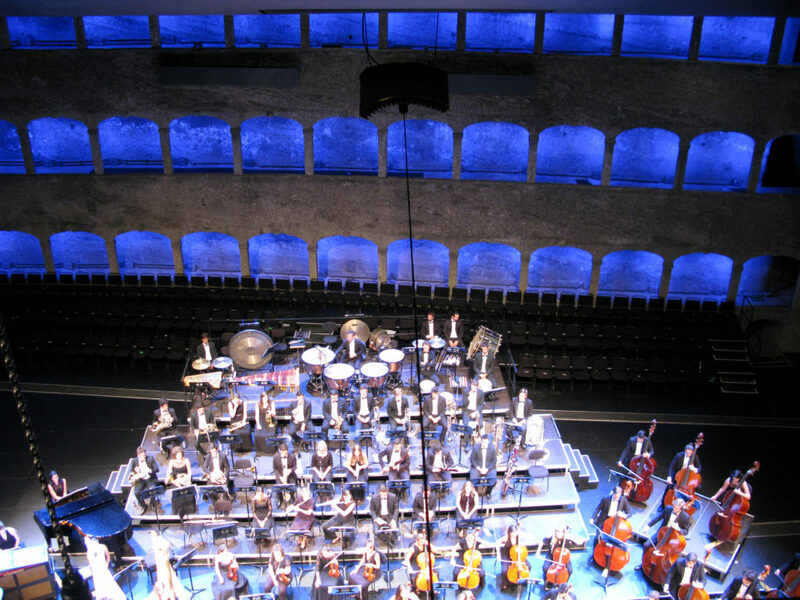 This recordings are often used by radio and tv-stations and are important for the archive of the Salzburg Festival. This “in-house recordings” are realized with only three microphones – one Nevaton BPT and two outriggers (Schoeps CCM4, cardioid) which are installed quite far away from the stage, to make sure that they are not seen by the audience and do not disturb light engineers. That’s why in the hall “Felsenreitschule”, the Nevaton BPT is almost 14 meters away from the orchestra-pit (in other halls the distance is even greater). How is it possible to get such a precise image of the performance with only three microphones which are installed far away from the stage and without any supporting spot-microphones in the orchestra? One of the reasons is the high directivity of the used figure-8 capsules of the Nevaton BPT: a crossed fig-8 pair (Blumlein, for the stereo-image) and one mid-capsule which is facing the centre of the stage. Additionally an acoustic panel is used to shield the Nevaton BPT from sound arriving from the back of the microphone. The mid-capsule can be used to add the desired amount of weight to the center and to zoom in to sound-sources, whenever this is needed – Think f.e. 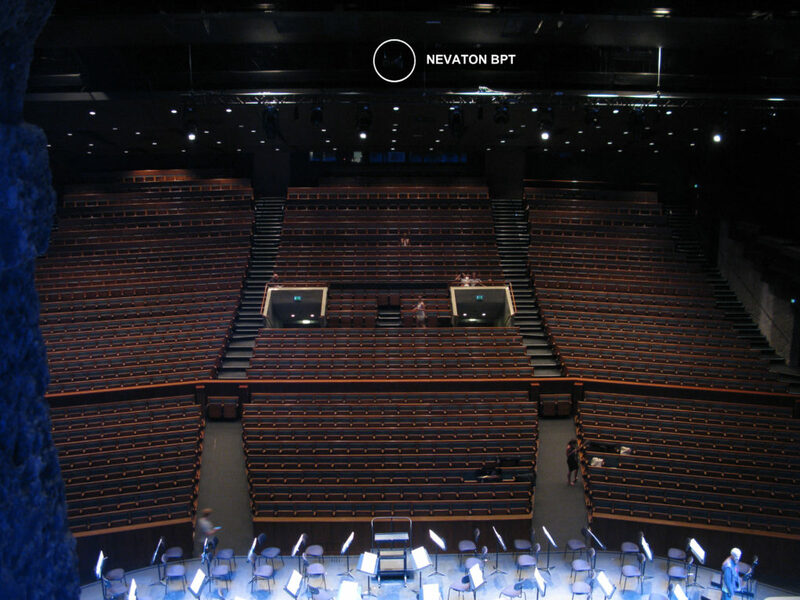 about speech intelligibility in opera – If we are facing such a problem we are easily solving it by adding gain to the mid capsule and magically zoom in to the vocalist(s) which then can be perfectly understood. The same is possible with instruments, like f.e. to feature a solo instrument in certain parts of the performance. The mid-capsule can also balance situations where singers are far right – or left on stage. In fact we are usually riding the fader with the mid-capsule during the recording, to make most of the balancing of our press-feed and recording already during the performance. If there are parts where we want a beautiful stereo-image the mid capsule might be 8dB below the side-signals, if we want to feature a vocalist which is fighting with a loud orchestra the mid-capsule might be 8 dB above the sides. The same technique (higher gain on the center capsule) can be used as an aesthetic choice to create a more “in your face” sound, which is sometimes favoured. We really enjoy all this possibilities which do not compromise the signals in any way and deliver a sensationally accurate spatial representation of the performances on stage with great deepness and transparency. As we are recording all three capsules of the Nevaton BPT on separate tracks (+ a sum of our live-mix on one additional track) we can make all the necessary adjustments also on a later stage in post production. The fact that the Nevaton BPT capsules are perfectly in phase also makes it possible to add a good amount of signals from our outriggers (to add the “stereo-sensation”) which still results in a track which is absolutely mono compatible. One thing which is important to know – Because of the general nature of the figure-8 pattern (with its characteristic roll-off of low frequencies) the Nevaton BPT does not initially provide a strong low end. It is very easy and effective to use filters to compensate for that characteristic of figure-8 capsules and we have an eq-preset on our mixing desk, which usually works pretty fine from the start and needs only little tweaking (depending on the performance and microphone angle). All in all it can be said that the system Nevaton BPT & outriggers works exceptionally well for a wide variety of performances. Even though it is installed very far away from the sound-sources we are getting results which are initially ready to be published on radio-stations or tv.